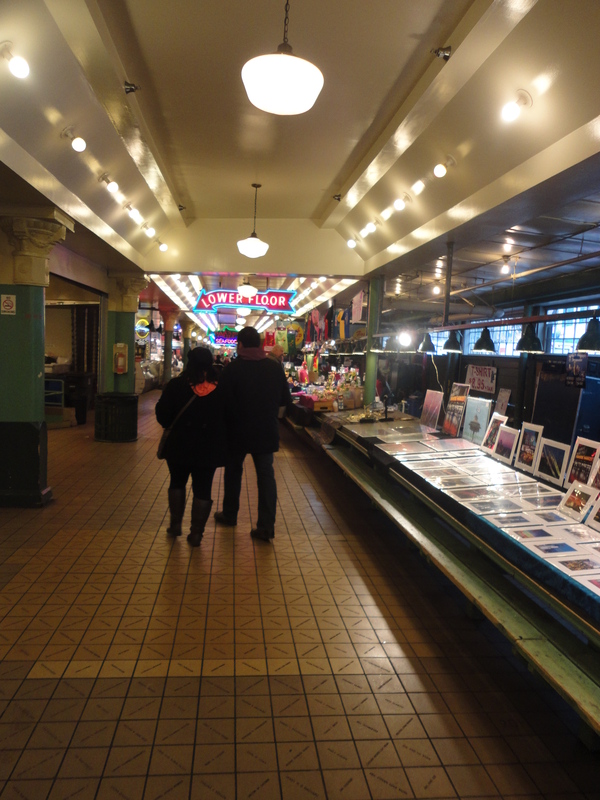 Here I am with my husband at Pike Place Market, this iconic place was our first stop. 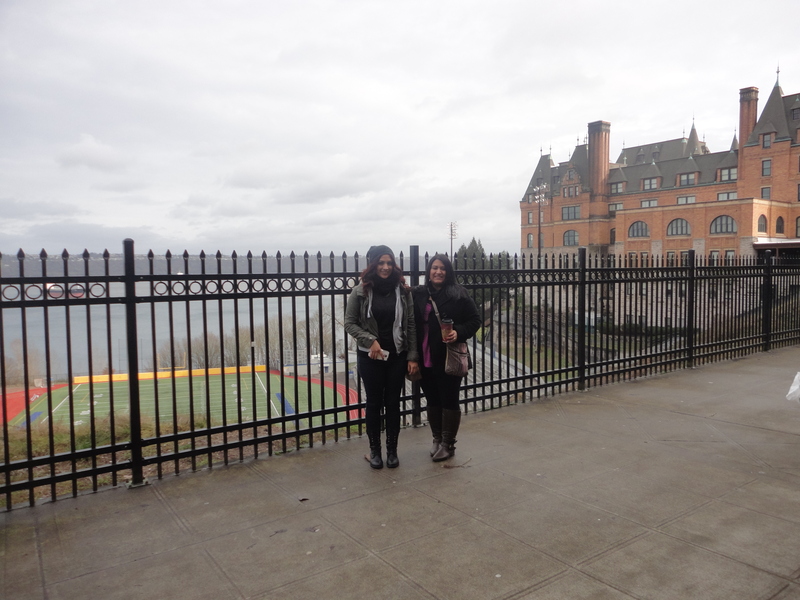 We were bundled up because it was chilly and drizzling a little. 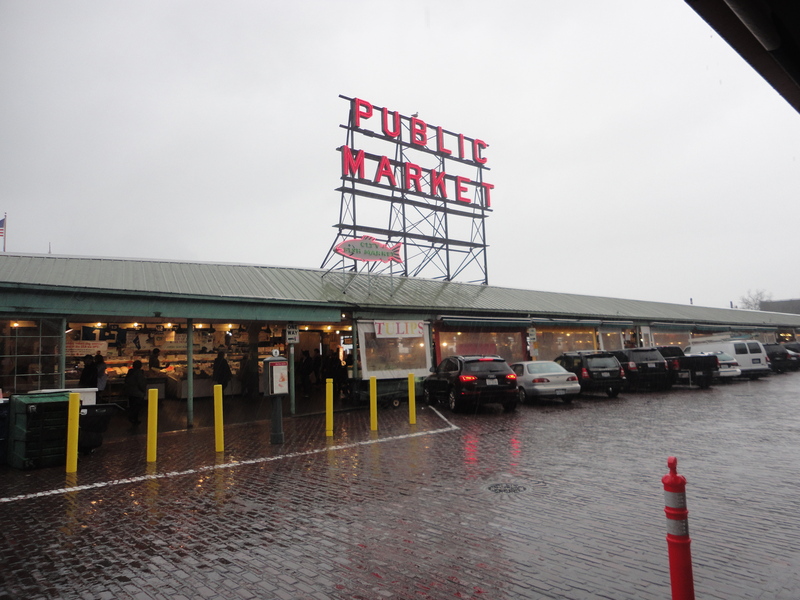 I’m so glad it rained a little bit, because when I think of Seattle I picture it cold, and I picture rain, and that is exactly what I got to see when we arrived. In this post I will show you guys some of our photos and talk a little about what we did. I don’t have super specific information since at the time I didn’t know I would be writing about it later, but I hope you still enjoy. 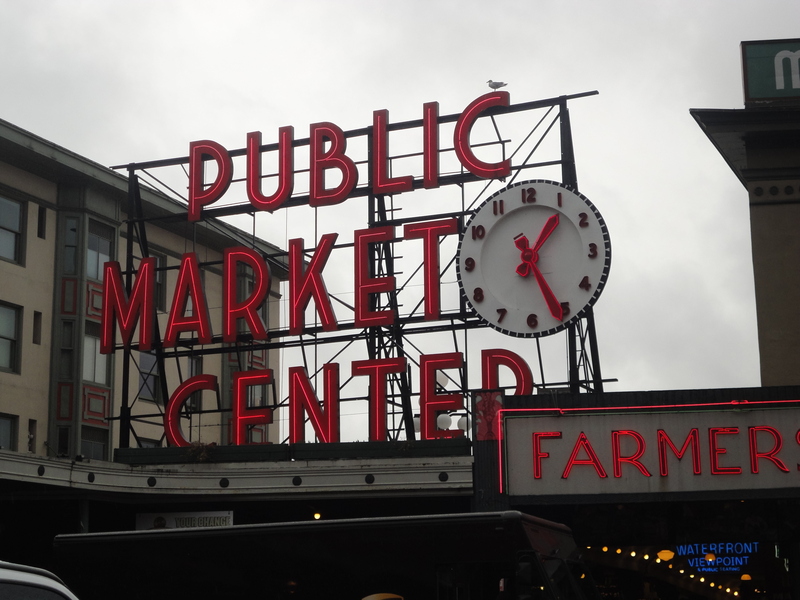 If you will be visiting Seattle soon this is still the post for you, because we tried to hit a lot of the bigger attractions. I was so excited to be there! 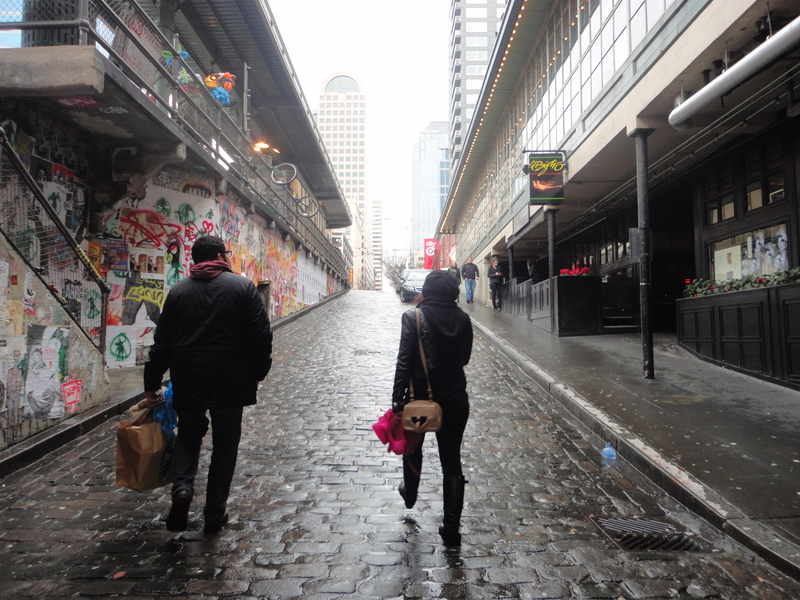 I mean, I pretty much felt that I knew Seattle anyway after so many episodes of Grey’s Anatomy. Yes, I am a proud Grey’s Anatomy lover. Yes, I have watched all seasons. Anyone else with me on that? Come on, don’t be ashamed. The market looks so small and narrow from the outside, but inside there are various levels with tiny stores, restaurants and stands with random things for sale. Art, snacks, jewelry, clothing, souvenirs. All that good stuff. 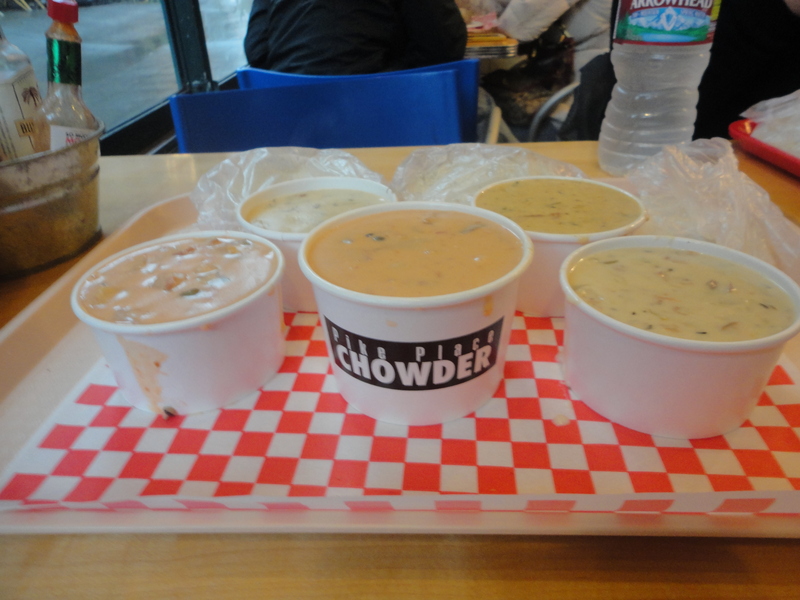 Above are chowder samplers at Pike Place Chowder, an award-winning chowder house across the street from the market. Tommy was in heaven. 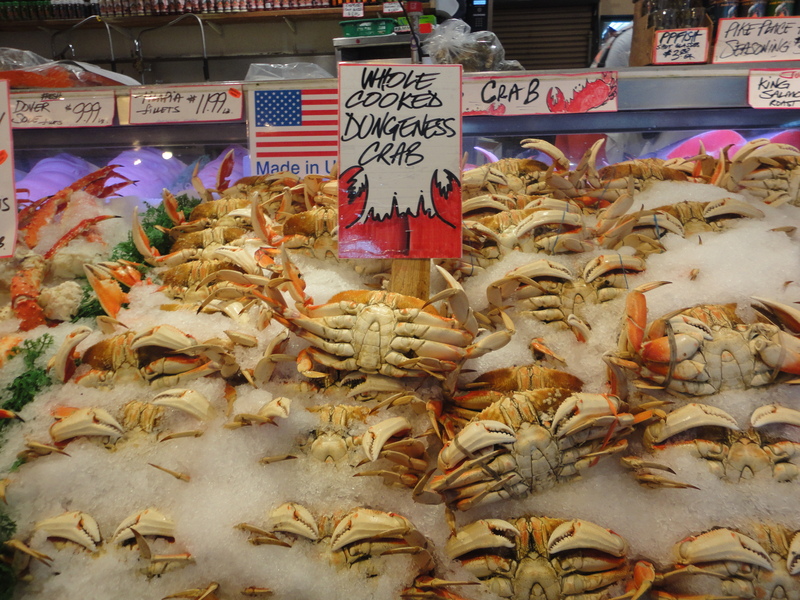 They have several varieties of chowder to choose from. 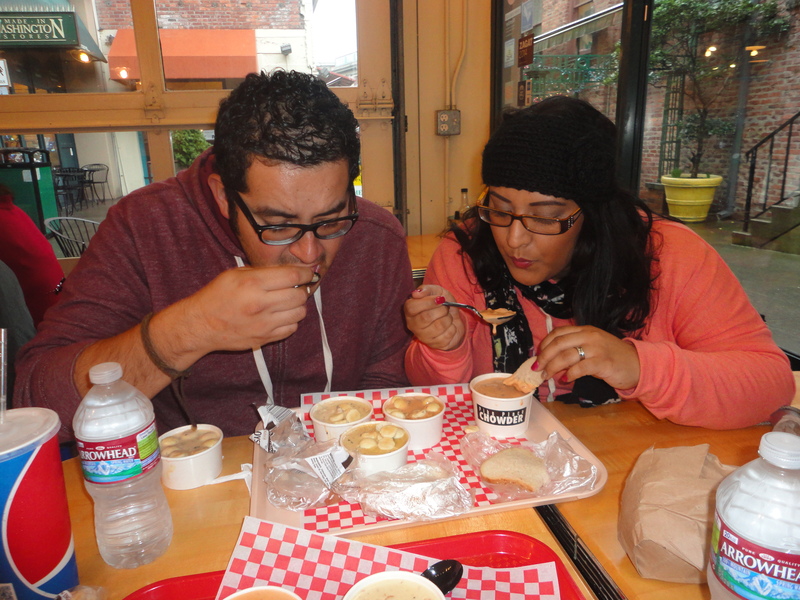 My favorite was the salmon chowder. Mmmm. They have oyster crackers and sourdough bread to go with the chowder too. My sister, Dani, is two years younger than me, and is a very talented hair stylist and makeup artist for Disney. She is awesome to travel with because she is adventurous, and she knows how to use her cell phone’s navigation unlike me! Here we are feeling super cute with our umbrellas. It was raining a little, I promise. 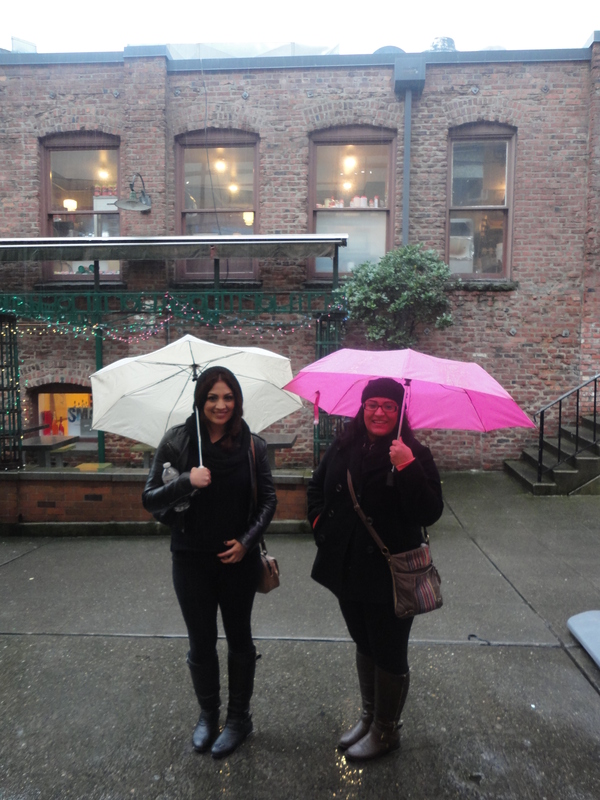 My husband was taking our picture and laughing at us, because it wasn’t raining enough for umbrellas. 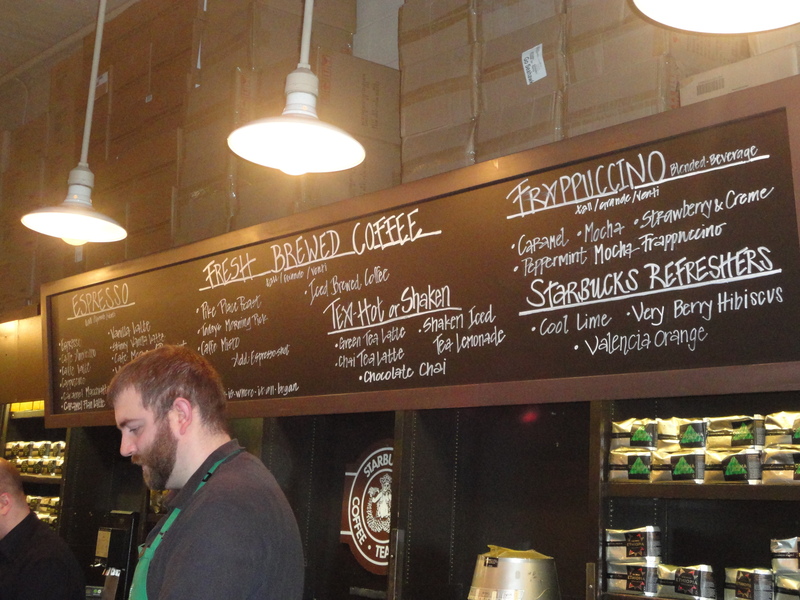 But, when in Seattle! Look at that gloomy grey sky! I absolutely love it. 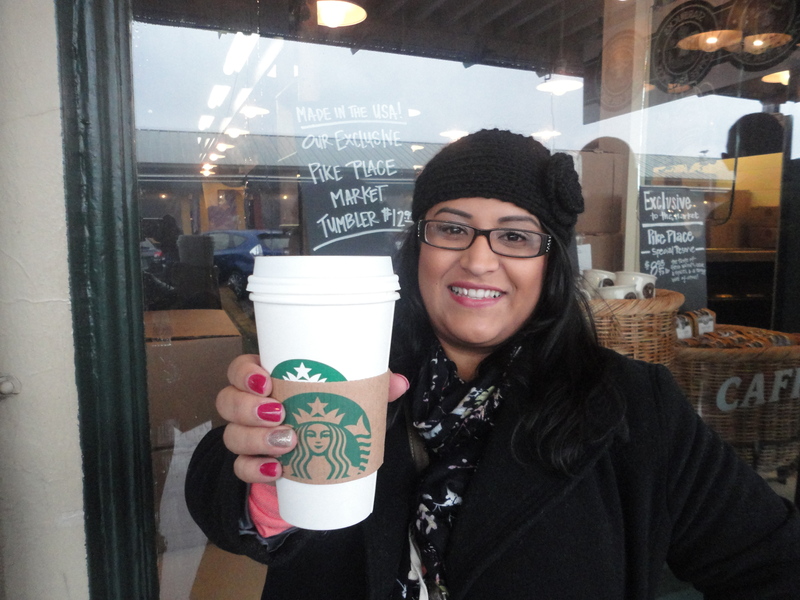 We visited the first Starbucks ever built. I thought it was pretty awesome and worth seeing. I picked up a cute travel coffee tumbler here and bragged about it to my coworkers when I came back home. Probably so un-Seattlelike of me, but there’s tea in that cup not coffee. 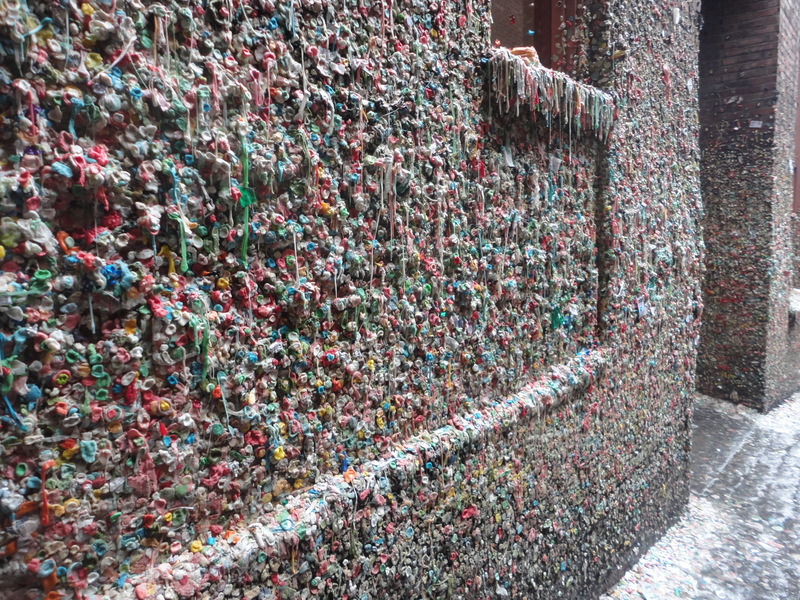 The famous Gum Wall. Nervous laugh. My sister added her piece of gum and left her mark, I passed on that! Does anyone else see that little red rectangle sign? Oh, it’s just me? City Target! Come to me, giant multi-story Target. 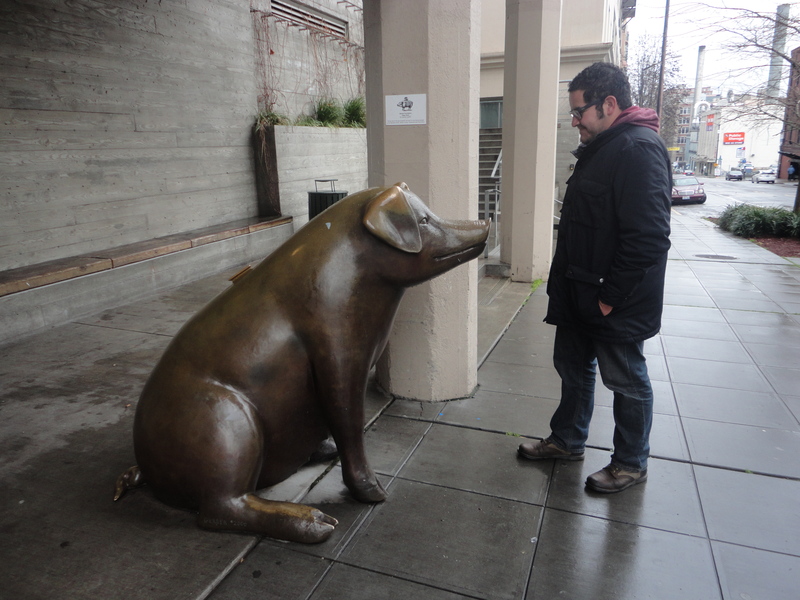 There are a few bronze pig statues “piggy banks” around Pike Place Market. 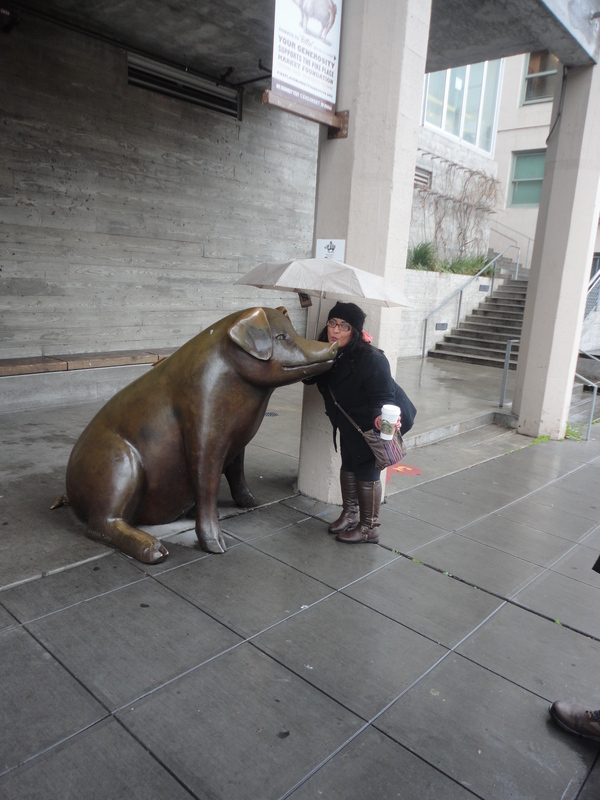 The original “Rachael the Piggy Bank” is at the front entrance and belongs to The Pike Place Market Foundation. 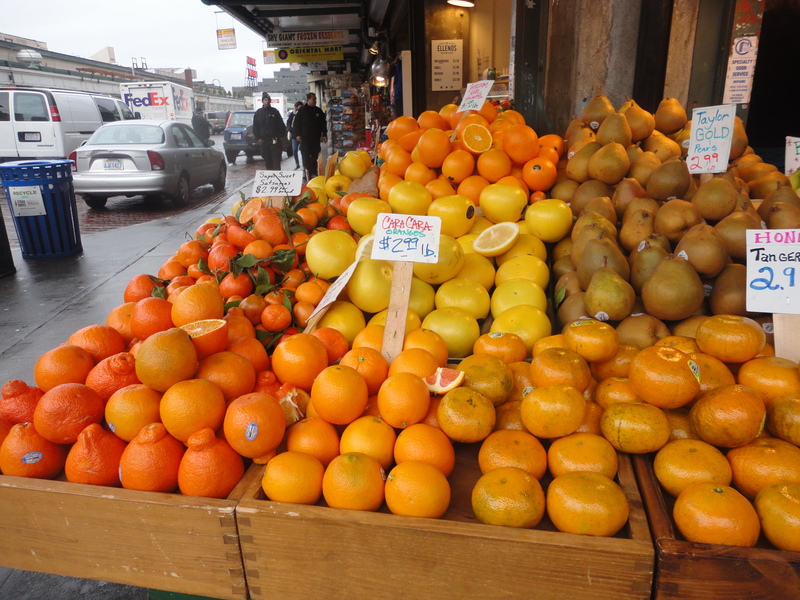 The money people donate supports low-income neighbors of the market. I thought that was pretty awesome. We drove by Pyramid Alehouse Restaurant and Brewery by accident while we were trying to figure out which freeway to get on. It was a nice pit-stop. 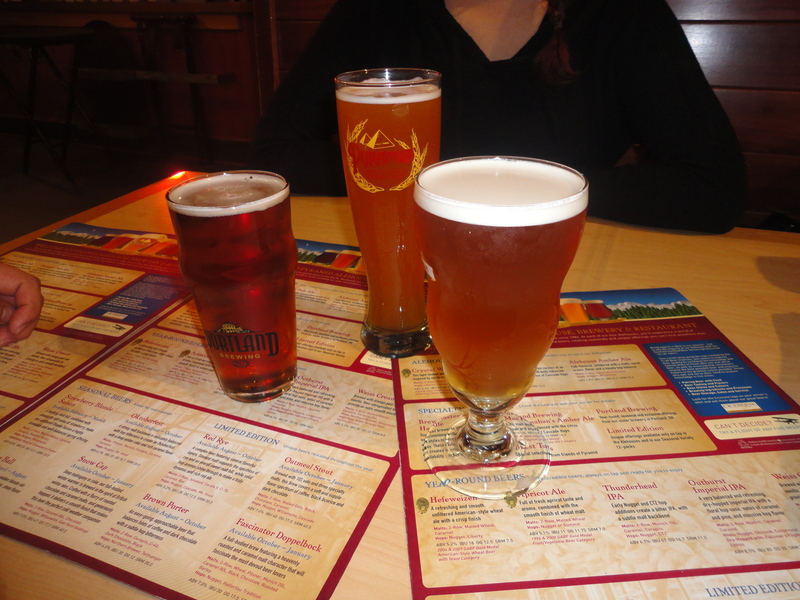 We enjoyed a beer and appetizers there. While in Seattle we did have a rental car. 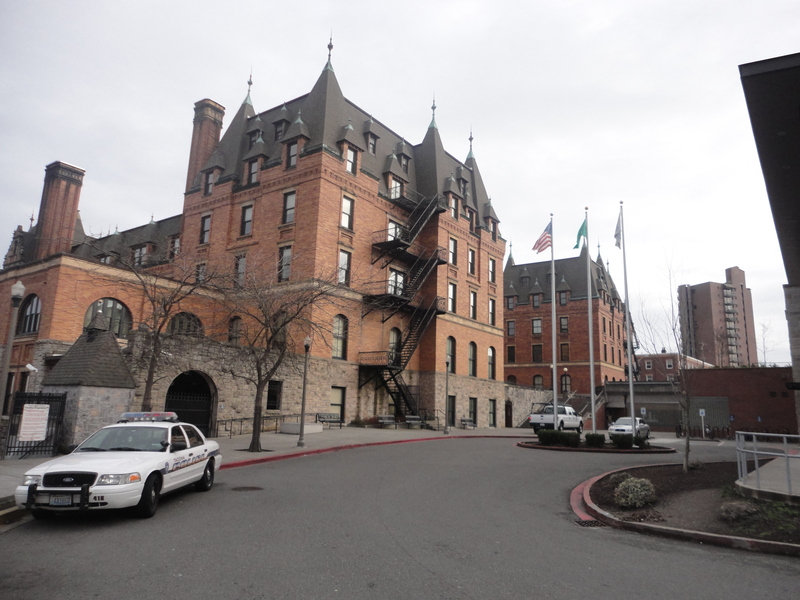 We needed one, because we also drove to Tacoma, Washington and met up with a friend who lives there. Thank goodness for my husband who is an amazing driver, because I don’t think I could have driven. Scratch that, I know I could not have driven. There is a lot of traffic, which makes me nervous, and overall I get a little nervous when I am driving in places I am not familiar with. We love public transportation when traveling, and if we had stayed only in Seattle we would have probably not rented a car. That being said, having our own car did allow us to see a lot in a short amount of time. 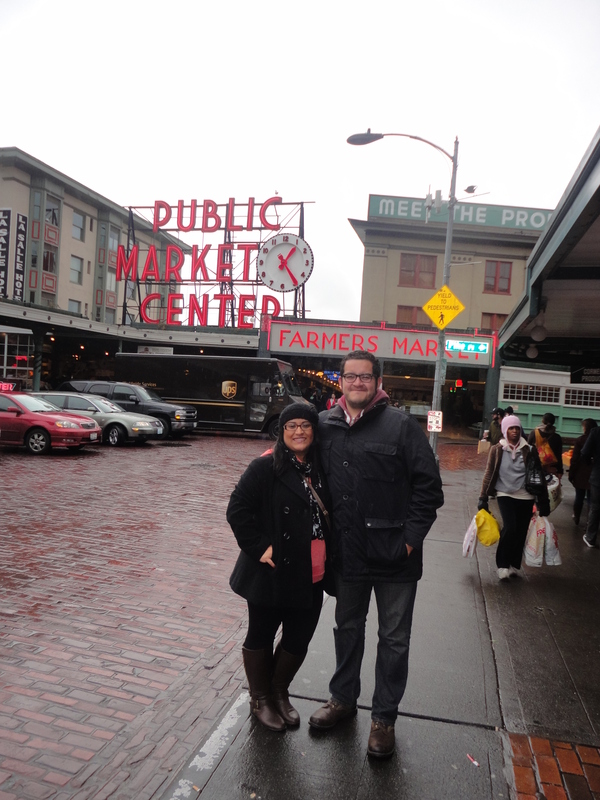 We spent three days in Seattle. 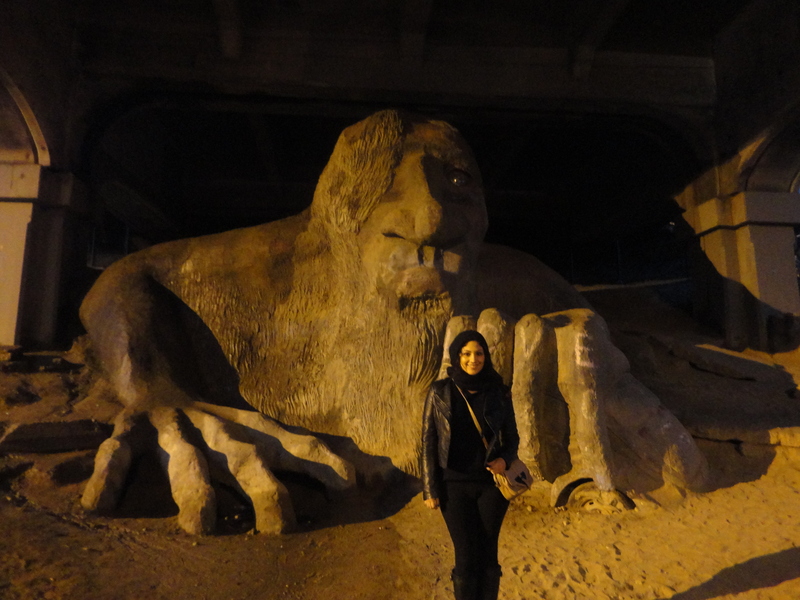 The Fremont Troll is scary at night! 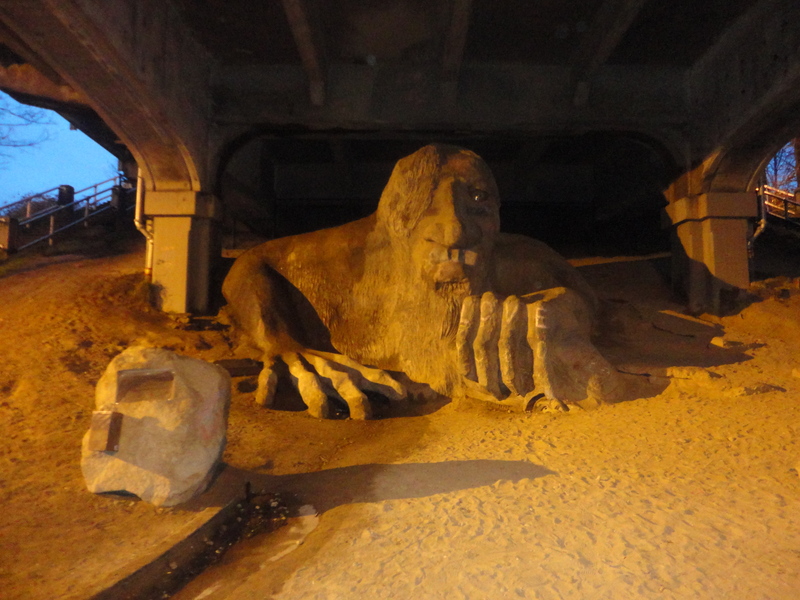 It is a huge sculpture under a bridge in Seattle. 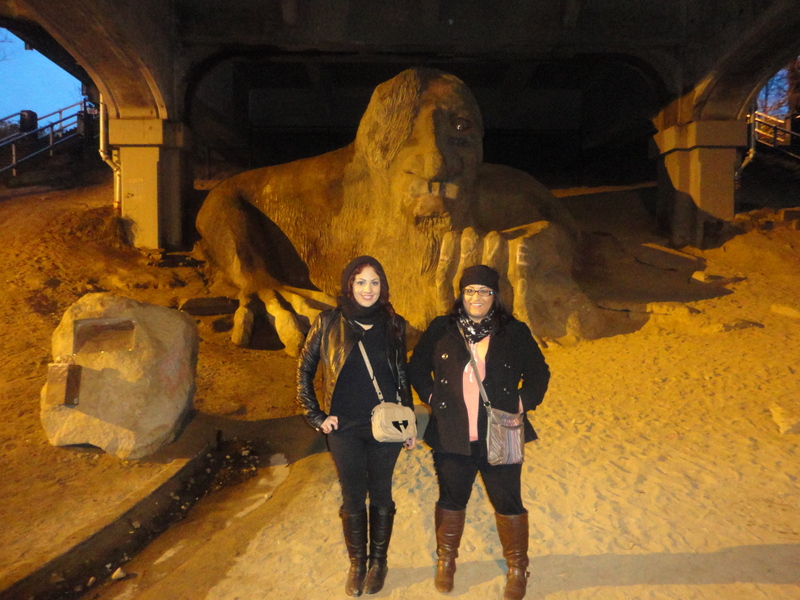 My sister and I were dying to see The Troll. We were a little obsessed with it! My husband didn’t understand why, but he drove us there anyway, (it was really hard for us to find) and we thought it was the coolest thing ever! 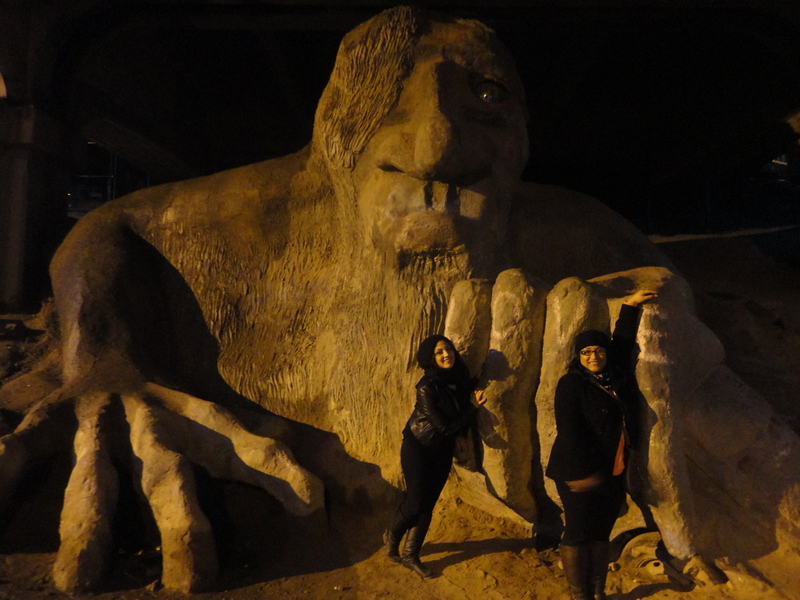 We took a million pictures with it until my hubs pretty much told us he wasn’t taking anymore. Haha. There is a real, full-sized old Volkswagen Beetle trapped under his hand. Ahhhh… so cool. See you next time, Troll. Xo. 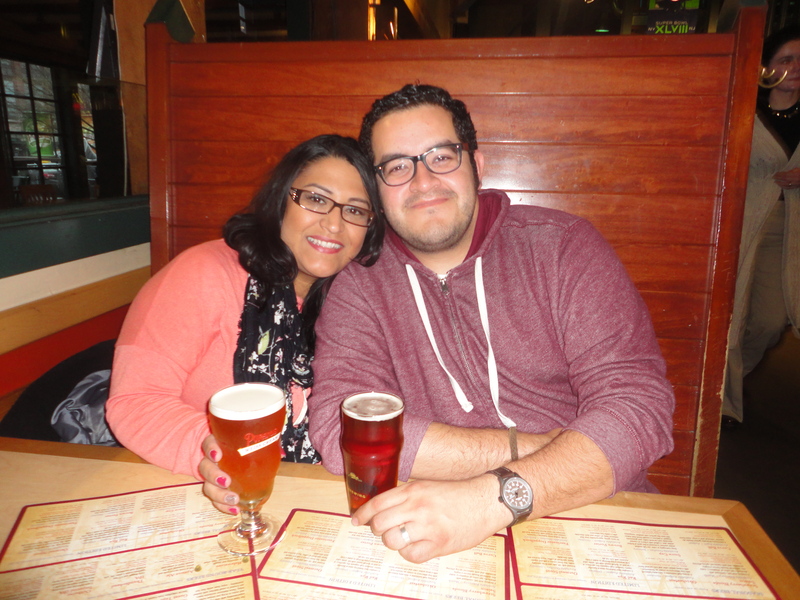 We had dinner in Tacoma at Boathouse 19, a cute restaurant on the marina. If I remember correctly, Tacoma is a little less than an hour outside of Seattle. 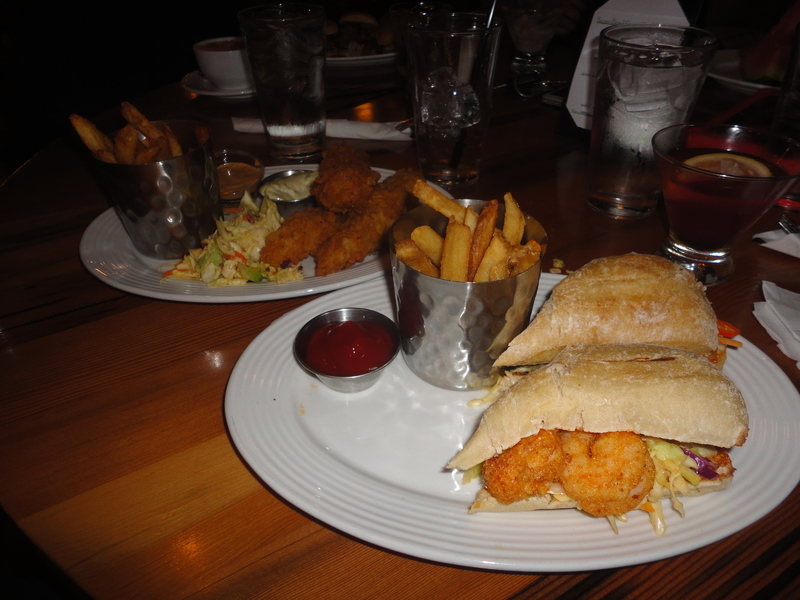 Tommy had fish & chips, my sister had a gourmet burger, and I had a shrimp po’boy. Let me tell you, the shrimp was plump, juicy, sweet and crispy! I didn’t like my cocktail though. I don’t remember what it was, but it was way too sweet and tasted artificial. Sadness. 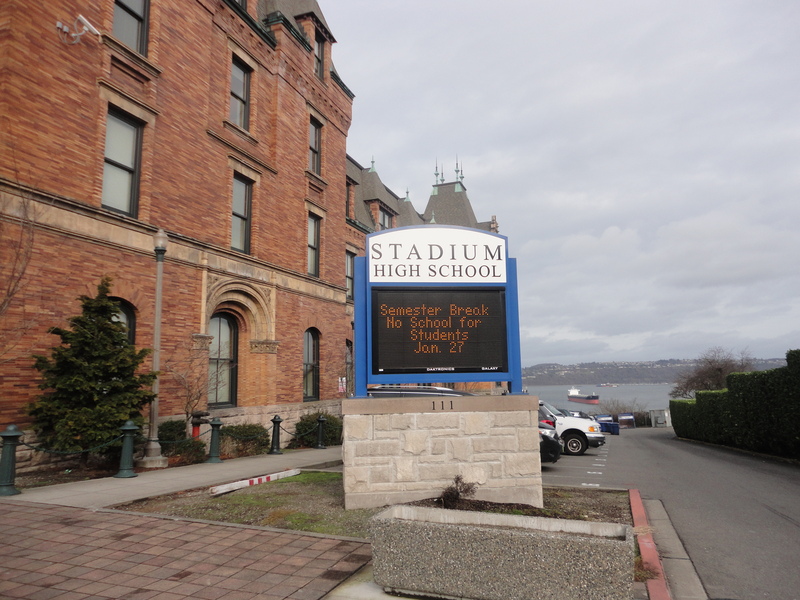 The next morning we visited Stadium High School in Tacoma. 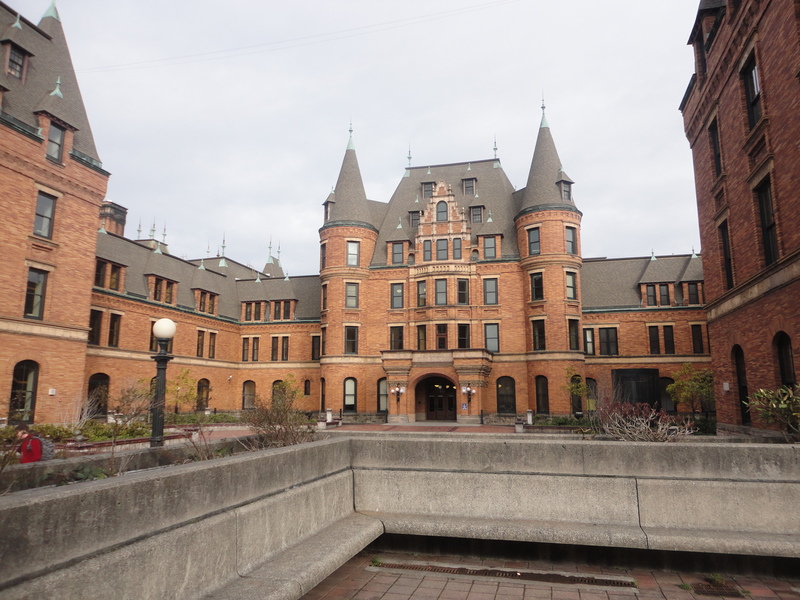 Stadium High School is a historic landmark over 100 years old, blah blah, blah… “10 Things I Hate About You” was filmed here!!! It’s pretty much one of the cutest movies ever, and the school is gorgeous. 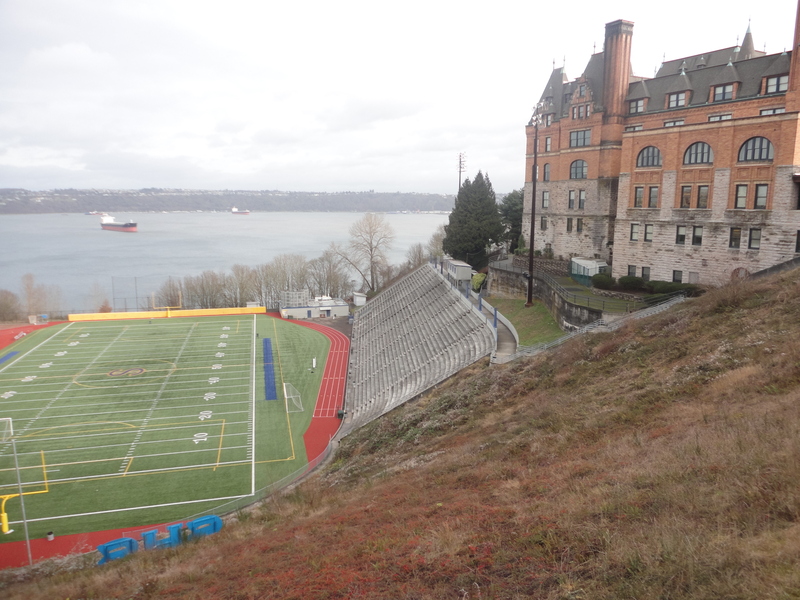 But seriously, it is a fully functioning real high school with students and everything. Duh, most schools have real students, Jackie! Lucky ducks. It overlooks the water, and it is just stunning. I was sad about my outfits, because in the photos once I put on my coat it looks like I am wearing the exact same clothes everyday, which I am not! Next time I will take more than one coat… There’s a tip for you, ladies. And in my cup, real Washington coffee that time. 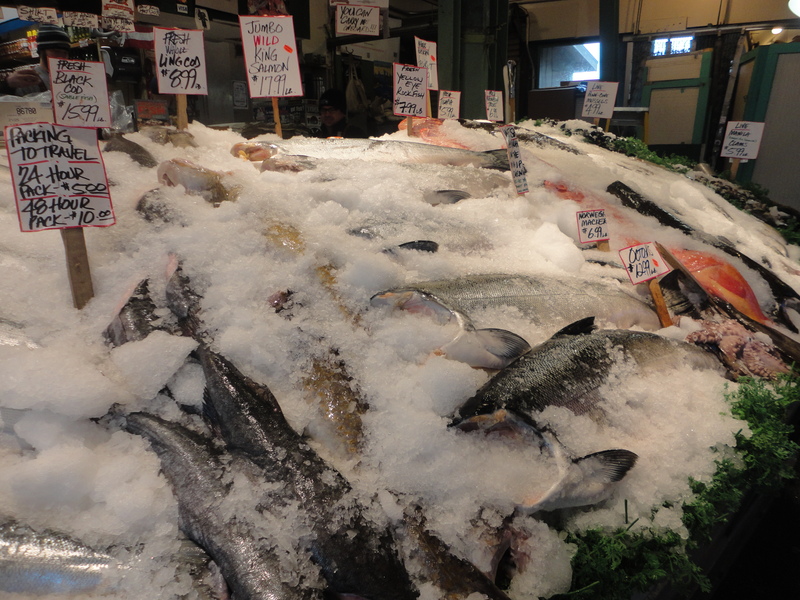 Come back and check out my part 2 Seattle trip, yeah? And then maybe even come see my Vancouver trip, because it was fantastic visiting Canada for the first time, okay? See you soon!